Ying Yuan from China are noted by some historians as the first gold coins. They there issued by Chu mint, the most ancient ones are about 5th or 6th century BC. Arguably, the first gold coins issued under King Croesus of Lydia during 6th century BC before Lydia was conquered by Persian Empire. They usually had an image of lions, bulls and rams. These gold coins were used for trade in Greek states as well. The gold Darics, first issued by Darius I in 6th century BC were widely used through Persian and later Greek empire. Weighing around 8.4 grams, they had the image of a great warrior armed with a bow or the Persian king. Philip II of Macedon created the world-famous gold coinage in around 350 BC ousting and undercutting Persia. Greek states started to introduce gold coins in 340 BC; Tarentum produced beautiful gold coins with a head of Persephone and infant Taras appealing to Zeus on the reverse; Heraclea produced fine staters with a Heracles and Athena in the helmet, who were strangling or wrestling with a lion or seated. Metapontum issued gold coins with a head of Leucippus, the founder of the state. Ancient Greek gold coins were also minted at Terina, famous for its beautiful Victory type; by Neapolis with the siren Parthenope and her father, Achelous; at Thurium with a very fine head of Athena and the bull on the reverse and at Velia with its head of a nymph and lion attacking a bull on the reverse. Alexander the Great introduced a new era in coinage, struck in vast quantities at a variety of mints from Macedonia to Babylon with uniform types and weights. After the vast issues of gold by Philip II, Alexander and Lysimachus, gold was but rarely struck. The aureus was a gold coin of ancient Rome with valud of 25 silver denarii. The aureus was regularly issued from the 1st century BC to the beginning of the 4th century AD, when it was replaced by the solidus. The aureus is approximately the same size as the denarius, but is heavier due to the higher density of gold. The solidus (solid) was originally a gold coin produced by the Roman Empire. The solidus was first introduced by Diocletian around 301 with weight of 5.3 grams of pure gold and with an initial value of 1000 silver denarii. This solidus was only struck in small quantities and had only minimal economic impact. Constantine I of Byzantine empire (Eastern Roman Empire) re-introduced solidus in 312, permanently replacing the aureus as the imperial gold coin of the Roman Empire. The solidus was struck at a rate of 72 from a Roman pound of pure gold, each coin weighing about 4.5 grams of gold per coin. By this time, the solidus was worth 275,000 increasingly devaluating silver denarii. 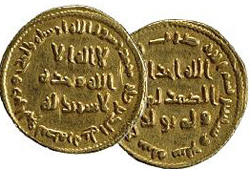 A dinar was originally an Arabic gold coin produced by the caliph Abd al-Malik through the end of the 7th century, who had access to gold from the upper Nile. Dinars had a weight of only 4.25 grams, but it was simular to the weight of the worn Byzantine's solidus that were circulating in those areas at the time. Malaysia launched gold dinars in 2006, which are simular to the original dinars in weight and purity of gold. Originally in 1997 they were proposed to be introduced as gold currency to replace US dollars and used for international trade in the Muslim world, but this proposasal failed. Currently, gold dinars are used mostly in Malaysia and value is based on the value of gold. The first issue of this coin is thought to have been under Roger II of Sicily, who, in 1140, produced ducats with the figure of Christ, and the inscription from Bible. The ducat was introduced by the Republic of Venice in 1284 under the doge Giovanni Dandolo (1280-1289). The Venetian ducat, called zecchino, featured the Doge kneeling before St. Mark on the obverse and Jesus on the reverse. During the Middle Ages the ducat gained much popularity, as it was easy to mint, and packed quite a value in one relatively small coin. Several cities and small states in Europe - mostly Eastern Europe in the Middle Ages - issued multiple, single and fractional ducats. Even now some national mints produce batches of ducats made after old patterns as bullion gold and banks sell these coins to private investors or collectors. The name of sovereigh comes from the impressive size and portraiture of the original coin, which showed the king seated on a throne on obverse, while the reverse shows the Royal coat of arms on a shield surrounded by a Tudor double rose. 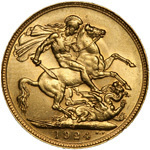 Gold Sovereigns were first issued in 1489 by Henry VII of England and they are still in production. Sovereigns were minted throughout British Empire in UK (London mint), Australia (Sydney, Melbourn, Perth mints), Canada (Ottawa mint), India (Bombay mint) and South Africa (Pretoria mint). While the coin typically had a nominal value of one pound sterling or 20 shillings, the sovereign was primarily an official piece of bullion with no mark of value anywhere on the coin itself. Original sovereigns were 96% gold and weighed 15.6 grams. Under Henry VIII the purity was reduced to to 92%, which eventually became and remains the gold coin standard (so-called crown gold) in both England and the U.S. The weight of the sovereign was repeatedly lowered until when it was revived after the Great Recoinage law of 1816, the gold content was fixed at the present 7.322 grams.